Home Parker Community Technologies Electromechanical Group Electromechanical Knowledge Base Can the AC890 be used in an electronic lineshaft application? To configure an AC890 drive for a Phase Lock application. In this example application, a Stand Alone 890 drive will follow an external Reference Encoder. An 890 Drive operating in the Closed Loop Vector mode and the software DSELite or DSE890. An Encoder or Resolver must be mounted to the motor. An 8903/EP Encoder Option card (or 8903/AI) must be fitted in the drive. The drive must also be configured for Advance performance. A FireWire 8903/FA option card is not required in the drive. In the COMMS CONTROL block set FIREWIRE REF SEL to True. In the VIRTUAL MASTER block set CHANNEL to 1 (or any channel but 0). In the VIRTUAL MASTER block set SOURCE to REFERENCE ENCODER. In the FIREWIRE REF block set CHANNEL to 1 (Channel must match step 2). In the POSITION LOOP block set ENABLE to True. This application requires that a 8903/EP Encoder Option card (or 8903/AI ) be installed in the drive. This will be the Master Speed Reference that the drive will follow. Make sure that the drive has been Auto tuned and the drive is operating in the Closed Loop Vector mode. Using DSE set up the function blocks as described above. 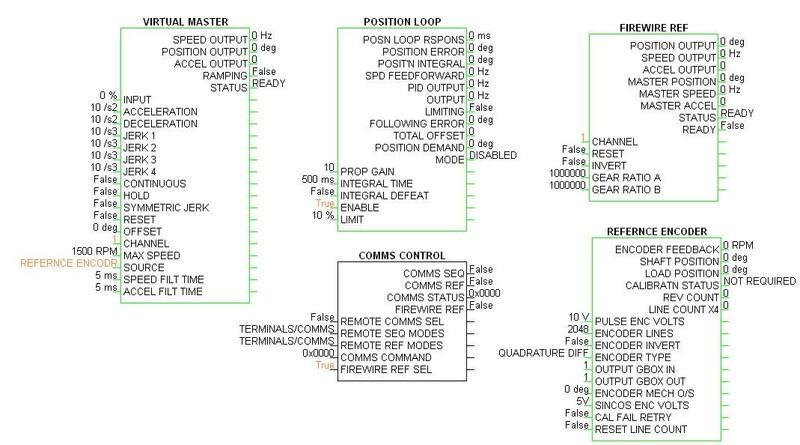 Enter the data for the Reference Encoder block. This is the external reference encoder that the drive will follow. Usually only the Encoder Lines will have to be entered. In the FireWire Ref block Gear A & Gear B may have to be calculated. 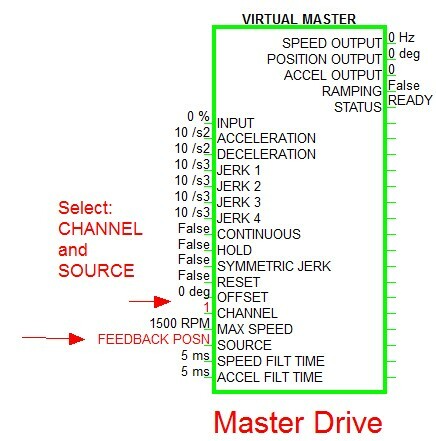 If The Gear A / Gear B is set to 1/1, the Slave drive will follow the Master Reference Encoder exactly at 1:1 speed. If the speed is different these parameters need to be set up. For an example, if the Master Encoder had a max speed of 3500 rpm, and the slave encoder has a Max Speed is 1800, set Gear A to 100000, and Gear B to 194444 to give 3500/1800 = 1.944444. This will gave a 1 to1 rpm speed match. If the Slave drive needs to go reverse, set the Gear Ratio A or B to a negative number. In the Comms Control block, the FireWire Ref Select was set to True to use the Fire Wire Reference. This could be switched false to do an individual jog or other function if needed. If a Rapid Traverse function is needed, the Phase Inch block can be used. When Adv or Rtd are selected, the block adds or subtracts counts in revolutions to the master position commanding the slave to speed up or slow down. The default rate scale of 1 and a maximum rate of 30 (which is the max value). If more counts are needed the Rate Scale can be used. This will have the drive increase/decrease at a very large rate. In this example application, 890 drives will be configured to obtain a Phase Lock application between a Master and Slave Drives. An 890 Drive operating in the Closed Loop Vector mode and the development software DSE890. A feedback device must be mounted on the motors. The FireWire option cards are also required on the drives. In the VIRTUAL MASTER block set CHANNEL to 1 (or any channel but 0). This is the Firewire broadcast channel, in which the drives will obtain their Speed Reference. 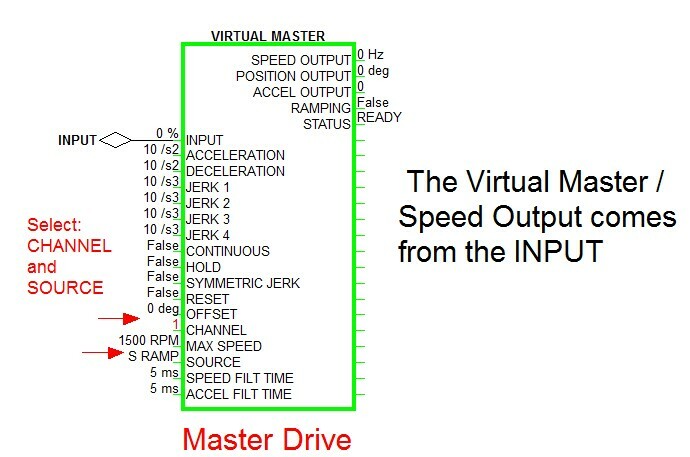 S RAMP the Virtual Master Output is derived from the INPUT parameter via an sramp function. 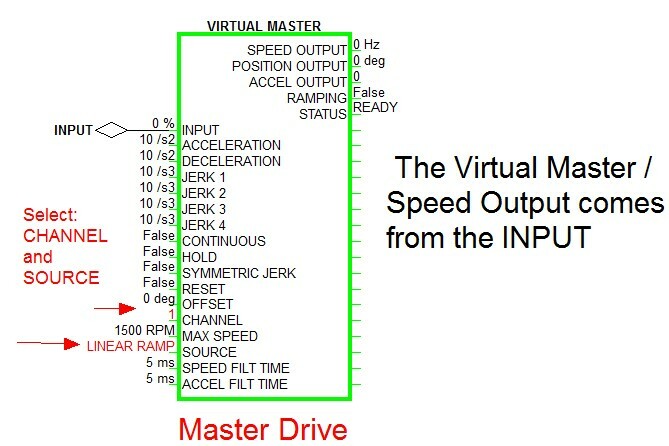 FEEDBACK POSN the Virtual Master Output is the motor shaft speed and position, unchanged. Thus the Speed Command is derived from the REFERENCE block. 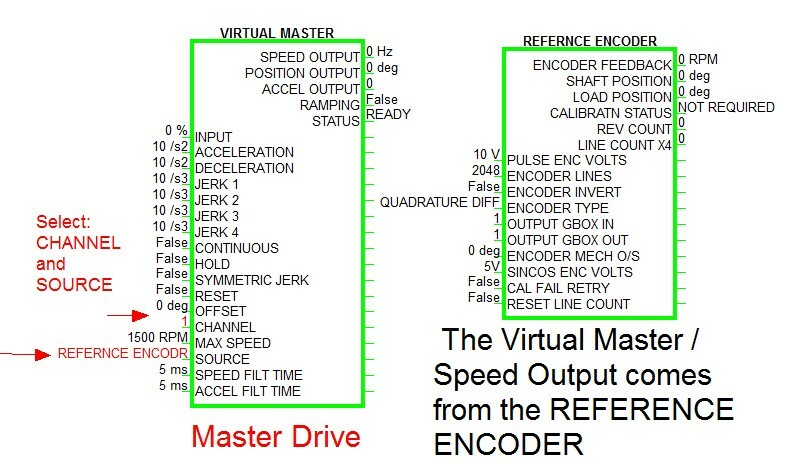 REFERENCE ENCODER the Virtual Master Output is the reference encoder speed and position, unchanged. Thus a Reference Encoder option card is required in Slot A. LINEAR RAMP the Virtual Master Output is derived from the INPUT parameter, passed through a linear ramp function. Using DSE890 set up the function blocks as described above for the MASTER drive. Select the SOURCE type to one of the 4 options described. 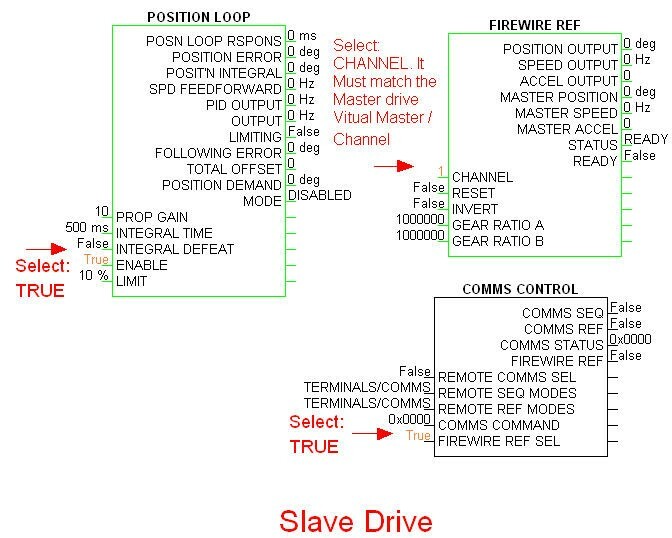 Using DSE890 set up the function blocks as described above and shown on Sheet 4, for the SLAVE drive. The Speed Demand is derived from the Reference block.